(HealthDay News) -- Transplant surgeons often feel emotionally drained and overextended, which are red flags for burnout, a new study suggests. Nearly half of the transplant surgeons in the study reported having a low sense of personal accomplishment and four out of 10 admitted to feeling emotionally exhausted, researchers found. "Burnout is common in medicine, especially in high-pressure specialties like transplantation," study co-author Dr. Marwan Abouljoud, director of the Henry Ford Transplant Institute, said in a Henry Ford Health System news release. The study involved 218 transplant surgeons; almost 87 percent were men and they ranged in age from 31 to 79. The investigators found 46.5 percent felt a low level of personal accomplishment and 40 percent were emotionally exhausted. Aside from emotional exhaustion, burnout is also associated with depersonalization. Surgeons suffering from burnout may feel distant from their patients. The study found, however, only 17 percent of the surgeons felt emotionally disconnected or distant from their patients. "This combination suggests that transplant surgeons are extremely invested in and engaged with their patients, but they are frustrated by the process," study co-author Michelle Jesse, a Henry Ford senior staff psychologist, said in the news release. The fact that transplant patients are often critically ill and may die waiting for an organ can take a toll on surgeon's feelings of personal accomplishment, the researchers noted. 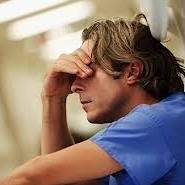 The surgeons who felt disconnected from their patients and emotionally exhausted also reported having less support from their co-workers. Meanwhile, they said they faced more psychological demands and more trouble interacting with their patients. "Difficult patient interactions -- like patients and families angry or crying while discussing end-of-life decisions -- are not uncommon for transplant surgeons," Jesse explained. "Those are hard conversations to have with patients who are sick. Our data suggests that those who are more comfortable with those conversations may be at less risk for aspects of burnout." The researchers said they plan to investigate ways to address burnout among transplant surgeons. "It's about creating a culture that allows them to thrive and supports them," Jesse concluded. "First we have to understand what contributes to the development of burnout, and then tailor interventions to their needs." The findings were presented this week at the World Transplant Congress in San Francisco. Research presented at meetings should be considered preliminary until published in a peer-reviewed medical journal. The American College of Surgeons has more about doctor personalities and burnout.